When you think of a hospital ICU, the image of a critically ill patient on life support comes to mind. In many ways, the inpatient unit in a behavioral health hospital is like the intensive care unit in acute care. Just like those who help ICU patients get through a medical crisis, the inpatient mental health team is there to help patients make it through and get to a better day. Never settling for the status quo, a team of leading providers at Rogers set out to improve the quality of inpatient care for patients with a focus on standardizing treatment to achieve optimal outcomes. It was no small task. The team started by examining system best practices as well as peer-reviewed literature from the medical field. 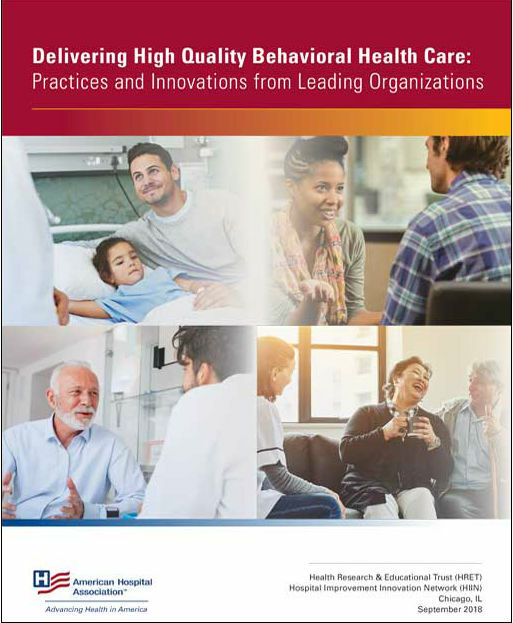 Then using a disciplined approach with lean methodology, they spent nearly a year developing, implementing, and refining the best possible protocols for treatment at Rogers’ three inpatient hospitals for adults, adolescents, and children. In addition to helping patients prevent self-harm during a crisis, the protocols are aimed at engaging patients in understanding the value of participating in therapy and starting work to build skills that can help them in the long run. Patients participate in five groups a day with a skill focus for each. There are mental health and addiction tracks with some groups targeting depression and other mood disorders, anxiety, or addiction. Using cognitive behavioral therapy (CBT) and dialectical behavior therapy (DBT), the groups focus on both patient engagement and safety. For example, patients learn about how to address anxiety with respiratory control and deep muscle relaxation. They practice mindfulness and the use of distraction to manage distress. And, they participate in motivational interviewing, a therapeutic technique that helps people to understand the costs and benefits of treatment, stages of change, and goal setting. Patients receive a workbook with educational resources and homework to be completed during treatment. A family resource guide is also being developed to help family members understand the mental health disorder, treatment, and how they can play a positive role in recovery. “One of the most exciting parts is our ability to measure the impact of the new protocols. We now collect outcomes on all inpatient units and we’re seeing positive results. We can demonstrate greater clinical improvement, higher patient satisfaction, and reduced 30-day readmission rates,” shares Dr. Brad Riemann, PhD, chief clinical officer. Using the Clinical Global Impressions (CGI) scale, a clinician-rated assessment of patient severity upon admission and assessment of improvement at time of discharge, 81% were much improved or very much improved, up significantly from 71% before use of the new protocol. For patients being treated for addiction, it went from 56% to 75% with a five-day stay or less and 20% to 92% with a six-day stay or longer. 93% of patients reported lower scores on the QIDS assessment, which measures depression symptoms at discharge compared to admission. Patient engagement in groups has improved as measured by attendance. There are significant reductions in self-reported suicide risk from admission to discharge. Those who experience a dose of treatment including two full rotations of care with the five group sessions building skills have the greatest improvement upon leaving inpatient care. Results were better with treatment lasting six days or more compared to five days or less. While the protocol demands standardization to ensure consistency in quality at the system level, treatment is customized based on individual needs. Rogers’ approach uses data to drive the development of treatment plans and to make sure that treatment is consistently effective over the course of care. “If the treatment is not producing the desired results, we are able to make adjustments. And then we analyze data at the program and system levels to continuously improve our approach,” explains Brian Kay, vice president, continuous improvement. “This work is critical because we know patients have a lower risk of suicide; lives are being saved,” says Jerry Halverson, MD, chief medical officer. "Once I got to Rogers the staff instantly greeted me with a smile. I immediately felt better and knew this is where I needed to be. Once I left Rogers, I felt like a new person. I was on the right medication, and I had new, amazing coping skills. … Being at Rogers was not scary at all! This is a safe place, this is a place that will get you the treatment YOU need. They will focus on family, coping, meds and a safe discharge plan. Now being back from Rogers, I am doing amazing. Every day I wake up and instantly feel much better. I am now stable, I feel like a new person. I don’t know how to put into words how thankful I am for my experience. Rogers has changed my life. Thank you so much, I don’t know where I would be without this treatment facility." Learn more about how Rogers contributed to an industry standard resource for inpatient care.